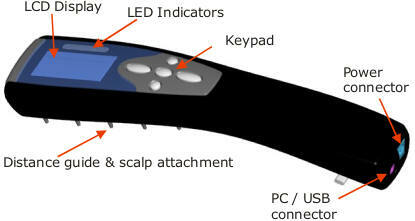 Dermaray Laser comb for hair loss. Dermaray Laser allows medical treatment for general or pattern hair loss, physiotherapy applications and pain management. The safest, most powerful and technically advanced hand held laser phototherapy available. Dermaray Laser is pre-programmed with treatment sessions for 25 major diseases and conditions. Dermaray Laser is the ONLY fully customisable, fully programmable and fully self-contained hand held laser system available. No bulky base controller, no mains power requirement and superior build quality using custom designed housings. Dermaray Laser is also uniquely able to adjust its power output level (not simply by turning on or off laser modules, this is only changing the surface area - not the power level) by electronically controlling the actual power level to each individual laser module. No other laser comb comes close to the power, performance and reliability of Dermaray. Dermaray Laser is the easiest, smartest, safest, most convenient and effective system available. It can be used in Manual Mode exactly like an old laser comb or laser brush and simply turned on or off but with the added benefits of battery operation, universal power supply and many unique safety features or in Advanced Mode under the watchful eye of our smart computer controlled system. Dermaray Laser is so easy to use, in most cases, a manual is not even required. A printed user guide is available optionally and free of charge if required. Dermaray takes the guess work out of home phototherapy and offers a level of safety and automation unique to Dermaray. No prescription or doctor's letter required to purchase - delivered world-wide by express courier. Dermaray Laser is constructed from the highest quality and strongest light stabilised composite plastic available. Dermaray Laser is the safest, easiest to use, most intelligent and more effective laser comb. Dermaray Laser is a unique and powerful LLLT medical laser system. Cold RED lasers are frequently used for the treatment of hair loss and promotion of hair regrowth, cosmetic applications such as wrinkle reduction, wound regeneration and physiotherapy. Dermaray Laser contains unique and patent pending safety proximity detector protects against accidental exposure and eye damage, deactivates the laser emission if an unsafe situation is detected. Dermaray Laser uses a powerful and extremely reliable high capacity Lithium Ion battery the same type of battery used in mobile phones and other digital electronic devices. Dermaray Laser uses a custom designed fully intelligent on-board battery charging system that prevents against overcharging and damage batteries, significantly extends battery life and reliability. Dermaray Laser is supplied standard with a universal 110-260v, 50~60Hz switching power transformer that can be used anywhere in the world by changing the external connection cable to suit your location. Dermaray contains 512kb memory capacity for storing individual 10 patient programs each with up to 32 treatment areas, statistics and session information. Ideal for general doctors, dermatologists and skin clinics. Dermaray Laser contains powerful microprocessor controlled and digitally temperature monitored laser modules, not inexpensive LED lights. Dermaray Laser is an intelligent system based on powerful NXP, 32bit microprocessor and a flash software upgradable design. Dermaray Laser offers an easy, unique and innovative configuration wizard that prompts the user for the skin condition to treat, skin type and areas requiring treatment and then calculates suggested exposure times accordingly, no more calculators, pens and manual record keeping. The Dermaray Phototherapy Operating System (POS) intelligently and dynamically manages frequency and duration of each treatment exposure significantly improving patient safety and dramatically reducing the possibility of over exposure. Advanced microprocessor controlled management of each individual laser module significantly extends laser module life and allows for control of specific laser intensity e.g. 0-100% or even pulsed treatment. Treatment can be delivered at 1~20mW or a gradually increasing treatment program can be selected. Ability to activated or deactivate individual laser modules for a smaller treatment area, for example a spot treatment. Electronic recording of total exposures and previous session times with auxiliary battery backup. Most other battery systems are based on older less reliable NiCad batteries and have no battery over charge protection that results in reduced battery capacity and diminished battery life. Electronic temperature monitoring ensures trouble free operation and inbuilt exhaustive hardware self test system. Each Dermaray-Laser undergoes extremely rigorous post production testing, battery charge and discharge testing, operational, extreme climatic and environmental testing to ensure years of trouble free operation and the highest manufacturing quality. Packaging includes Dermaray Laser, a universal in-line approved power supply and two pairs of safety goggles, large and small design. To help save our rain forests, a printed user guide is not included as standard, instead please download the latest Dermaray Laser user guide. Dermaray Laser has Australian TGA Class 1 listed, CE mark, FCC mark and Australian C-TICK marks. Dermaray Laser can safely be used with our Hair Treatment Pack. The demonstration videos below provide an overview of the setup and general operation and features of the Dermaray Laser LLLT Laser System. All of our videos are viewable on the Dermaray YouTube Channel here.